Retiring from the U.S. military is a sweet deal for the 17 percent of veterans who are allowed to serve for twenty years on active duty. Too sweet. For decades, critics and top brass have warned that the Pentagon’s defined benefit pension (earned after 20 years of service) is growing exponentially more expensive. Annual outlays for military pensions exceed $50 billion and will double before today’s lieutenants become generals. Liabilities of the program are $1.3 trillion (roughly one tenth of size of the U.S. GDP) and will rise to $2.8 trillion in 2035. As alarming as those numbers might be, fiscal woes are not the real problem. The real problem is that the military services need to modernize talent management, but they are stuck with this anachronistic pension structure. As the Gates commission noted in 1970, the all-or-nothing vesting of the retirement benefit at 20 years isn’t fair and hinders talent management. Another problem is that benefits pay out immediately upon retirement instead of at 65 or some other fixed age. These sweet features distort work incentives on both sides of the cliff. Too many personnel stay in uniform before the 20-year cliff, and too few stay after. Twenty-year retirement, in conjunction with present personnel management policies, is an inefficient means of attracting new members, causes the services to retain more members than are needed up to the 20-year point, provides too strong an incentive for experienced personnel to leave after serving 20 years, and makes it impossible for the vast majority of members to serve full careers. It made this argument repeatedly over the years, echoing other official studies. In 1996, the GAO warned, “the services have been reluctant to involuntarily separate personnel with less than 20 years of service.” In 2006, the Defense Advisory Committee on Military Compensation took aim at the status quo pension system as inefficient, inflexible, and inequitable. In 2011, the Defense Business Board issued a report that offered the latest harsh critique and proposed replacing the defined benefit entirely with a savings plan. In contrast, the recommendation issued in late January 2015 by the Military Compensation and Retirement Modernization Commission’s final report offers no analysis of the distortionary effects of the status quo. It may be the first major commission in half a century to recommend leaving the defined benefit pension in place. The report’s mild recommendation trims the monthly benefit by one-fifth but adds a small savings asset, much like the 401(k) that many private sector workers save with a monthly match from their company. This reform will save Pentagon some money, but will not change behavior. The first is copied from the MCRMC’s interim report, and shows the continuation rate of officers in the Department of Defense and its four branches over the years of service (YOS) of current year group cohorts. There is a distinct retirement bubble at the 20th year. Figure 1. Continuation rates by Year of Service (from MCRMC final report). CLICK TO ENLARGE. The second figure is copied from an Army War College report, and it shows the same data more clearly by breaking down the likelihood of separation for each year of service, which approaches zero until year 20 when it spikes dramatically. Figure 2. 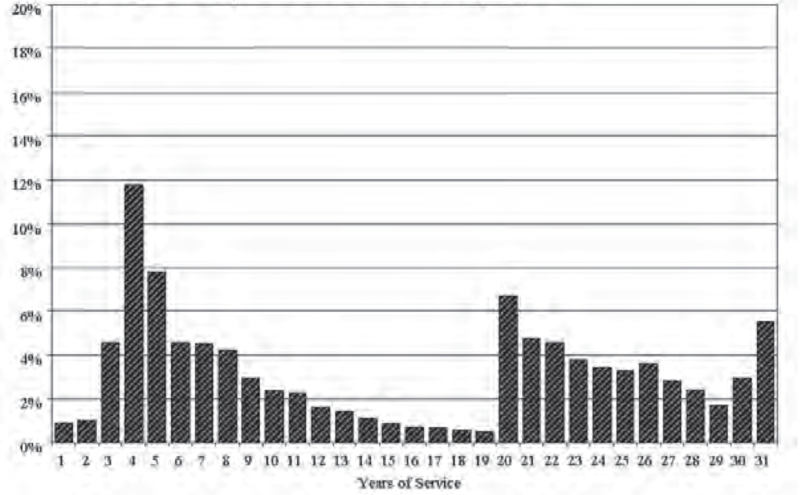 Continuation rates by Year of Service (from “A Framework For Restructuring The Military Retirement System,” July 2013). CLICK TO ENLARGE. The third figure is mine, and one look explains the 20-year bubble. It shows the value of each additional year of work during an officer’s career, which escalates up to $1 million during year 20 and collapses during year 21. Every service member contemplating retirement is well aware of the money at stake represented in this third figure. Figure 3. Officer’s value of work by Year of Service under current pension plan. CLICK TO ENLARGE. Let your eyes linger on Figure 3, because it explains in a picture what is broken with the current military retirement structure. The total expected value of retiring at 20 years is worth nearly a million dollars, which means that the last two years of work in uniform are worth roughly half a million each to a typical officer (annual base pay plus half of their retirement stream). 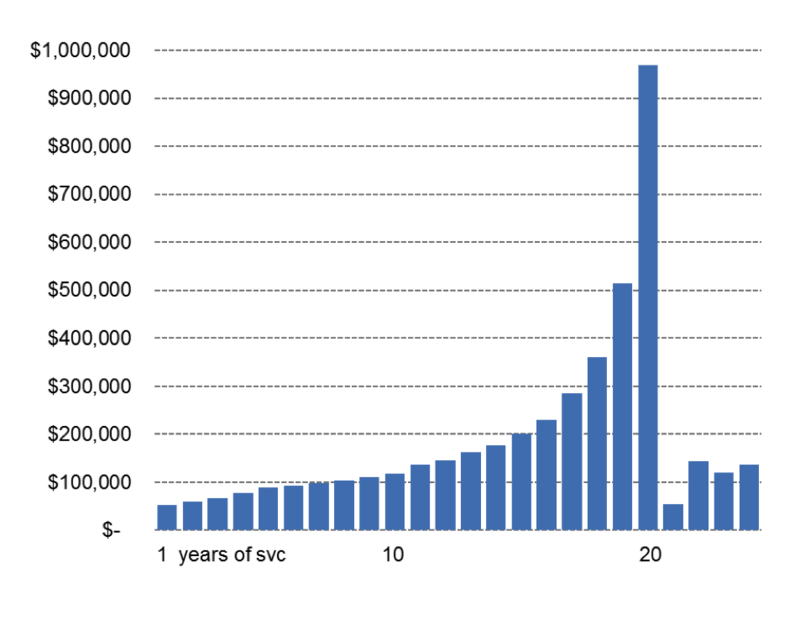 The last five years from the 15-year point are worth a little over $200,000 per year. Basically, you would be crazy to leave so much money on the table during years 15-19. But then the value of work collapses in year 21, which is why more than half of all active duty troops who retire do so immediately after their 20th year. Over half. I also modeled the value and cost of a completely new kind of military pension along the lines called for by the Defense Business Board’s 2011 report. I will explain it in more detail in a forthcoming Hoover Institution working paper. This “savings” pension would discontinue the defined benefit plan completely for new officers and enlistees, beginning instead at the five-year mark with a generous employer contribution to a savings account owned by the service member that equals 25 percent of base pay per year as well as a match of funds up to 25 percent of base pay. Yes, that’s 50 percent total from the government to an account you could access in full upon retirement. This is far in excess of the private sector norm, yet it would cost the military far less than the status quo. Under this plan, service members create an asset that will be more highly valued by the veteran retiree than the status quo defined benefit lifetime income stream, meanwhile saving the government $1.3 million per retiree. The status quo likes the status quo. I’ve been warned by a few retiree friends that ending the 20-year defined benefit is risky because lots of mid-career talent would leave. True. But that’s the point. Flexibility is vital to talent management, and pension flexibility will enable a continuum of service in which individuals can leave and also re-join the ranks. When soldiers can move flexibly in and out of active duty roles, they are able to gain priceless skills in the private sector and also bridge the civilian-military gap, which is effectively impossible given the current pension structure. By delinking retirement benefits from laying off (and hiring), force shaping by the Army, Navy, Air Force and Marines is suddenly much more flexible. There will be no more agonizing about forcing troops into early retirement, which is an anachronistic concept. Instead, the services can start thinking about their human capital in terms of skills and talents instead of year group cohorts. When policymakers consider compensation reform, they must analyze options that break free from the defined benefit retirement structure entirely. It is a recommendation that is half a century overdue. It has been recommended by a dozen expert commissions. And it is the essential first step in modernizing the Pentagon’s talent management process. Tim Kane is a research fellow at Stanford University’s Hoover Institution and has twice served as a senior economist on the Joint Economic Committee of the U.S. Congress. He is the author of Bleeding Talent. This research is made possible by a grant from the Smith Richardson Foundation. He is a former officer in the U.S. Air Force.